When Was The Last Time You CLA’d That Thing? Perusing an online auction site this morning I came across a Leica X1 offered for sale. The seller informed potential buyers that the camera had recently received a “CLA (Clean, Lubricate, Adjust)”. The obvious question in need of asking is this: why would anyone think that a 3 year old fully electronic camera would need a “CLA”? What would you “clean, lubricate and adjust”? I presume the camera could be sent for a sensor cleaning, although the X1 is a fixed lens compact whose sensor is fully sealed and opening it up would seem to be counterproductive if your intent is to shield the sensor from ambient dust. As for “lubrication and adjustment,” well, I’m stumped, which started me thinking, again, about the irrationality of many of us who love Leicas. 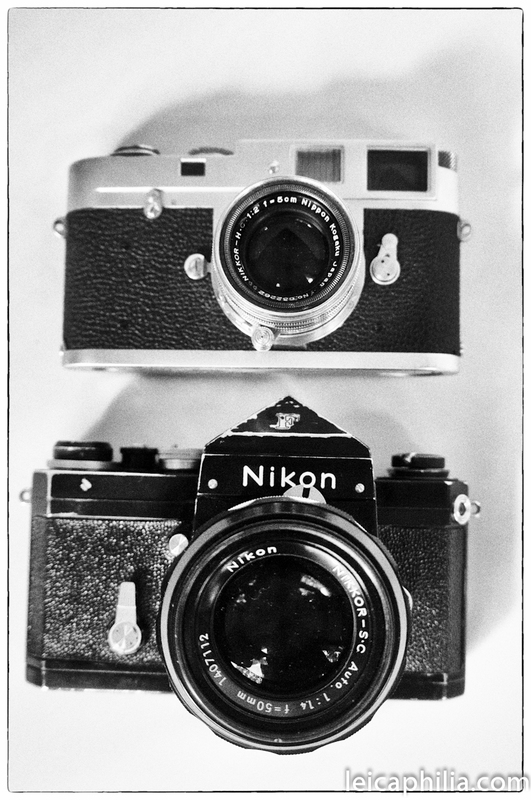 A Leica M2…and a Nikon F. A Tale of Two Cameras. The Nikon has never been serviced. It probably never will. I can’t see what the purpose would be. The shutter fires; the slow speeds sound right, the film winds on without complaint. The camera has no light leaks. There’s a little dust in the finder, but hey, what SLR doesn’t have a little dust in the finder? With its 50mm 1.4 Nikkor attached it produces beautiful negatives indistinguishable from those from the M2. It’s only stopped working once, a few years back. The shutter jammed. After diagnosing the problem, I gave the camera a sharp whack against my workbench, and the shutter started working again. It’s worked fine since. If I ever sell it (doubtful though that be), no one will ask me if its been “CLA’d”. My M2 was recently sent out for a “CLA.” The viewfinder front window had some haze on its inside and I wanted it clean and clear. A simple fix. But, while it was in for service, I figured it might as well be “CLA’d”. It still had its L seal, meaning it had probably never been serviced before, so it couldn’t hurt. Plus, I’d have documentation of its bonafides in case I ever wanted to sell it. It came back with a clear window and “buttery smooth” operation and calibrated shutter and official recognition that it had been serviced by Youxin Ye (a wonderfully nice man BTW and, from everything I’ve seen and heard, a superb Leica service technician). So what if it was “buttery smooth” when I sent it in, right? Cost: $160. This entry was posted in Cameras, Leica, Leica Rangefinder, Uncategorized on November 24, 2013 by Leicaphila.